Hi crafty friends! Today’s video is all about using stencils and spray inks; both together and separately from each other. 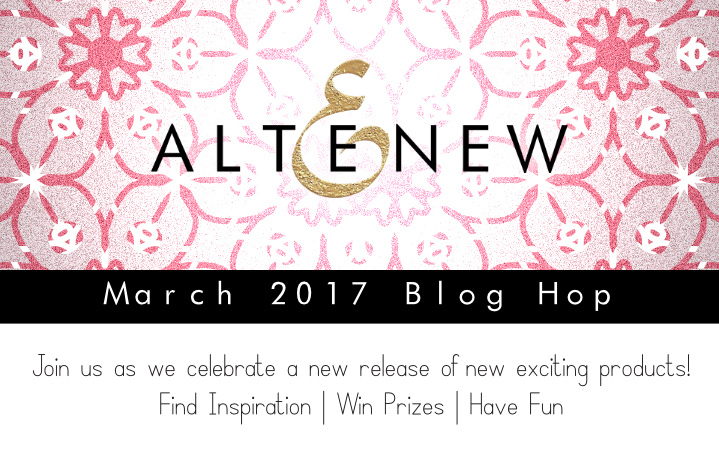 I’m also participating in the Altenew March Release Blog Hop! If you have been already hopping along, you should have arrived from my sweet friend Virginia Lu’s blog. Do you enjoy working with stencils? I love incorporating them into my cards. Today’s video is going to focus on seven different techniques for using stencils and spray inks; both together and separately. I’m going to share a quick overview of each of the cards I created and then you can see the video below for additional details and technique how-to’s! 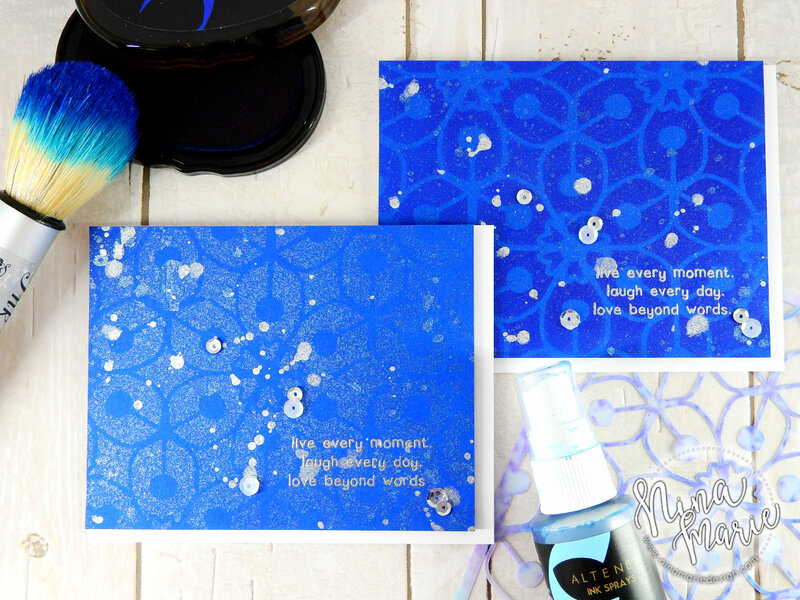 For these two cards, I used the Ocean Waves spray ink to create the shimmery effects which are SO gorgeous! 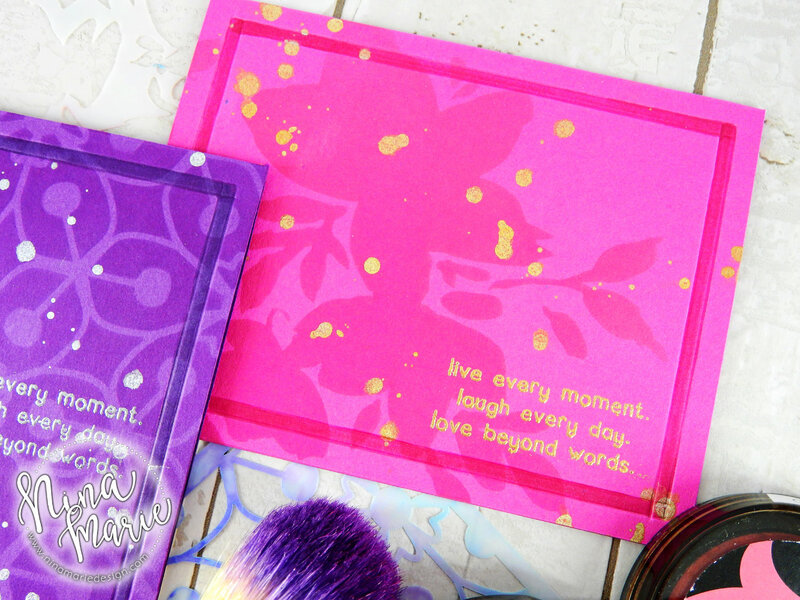 Both cards may look similar, but they feature different ways to apply the spray ink. On this first one, I applied the stencil directly onto the paper and sprayed the ink through the stencil. No ink was added, just the shimmery spray. I then let it dry and added a few gray and clear sequins around the sentiment. 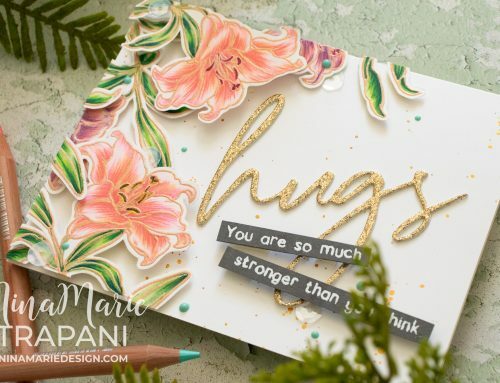 The sentiment is heat embossed in silver using Altenew’s Be Strong stamp set. This second card is pretty similar, but the difference is that I first stenciled the design of the Layered Medallion stencil onto the navy cardstock. Then I spritzed the entire paper with the same Ocean Waves spray ink, this time without the stencil laid over top. The result is just as beautiful but a bit more striking than the one without the ink blending. Both I think create gorgeous effects! Stenciling is a technique that has been around for a very long time. I love the anticipation of lifting off the stencil to reveal the beautiful design inked onto the paper… something about it is just so exciting! I wanted to do a bit of “traditional” stenciling with these products as well; its a look that will never go out of style. 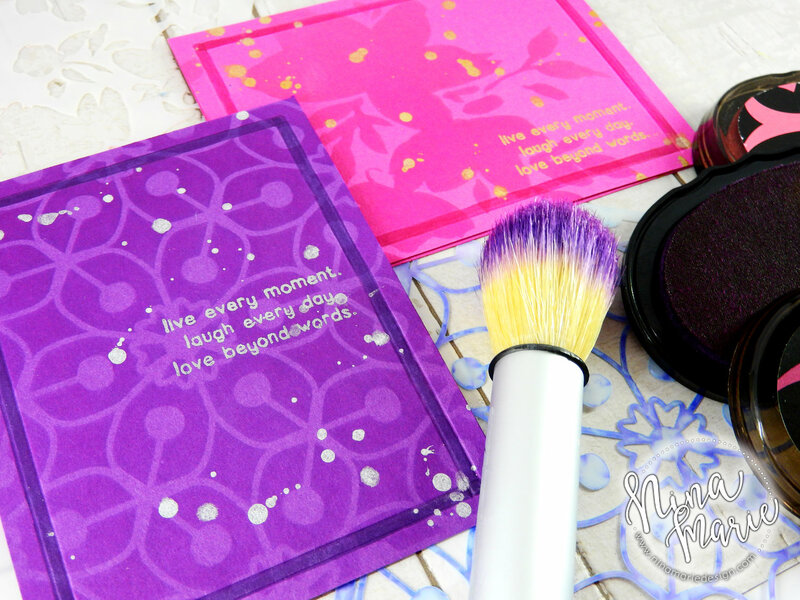 For the purple card, I used the Layered Medallion B stencil and some Altenew dye ink (Deep Iris); I stenciled the design onto some purple cardstock with an Ink Duster brush from Inkylicious. The border was created with a scoring tool; and to accent the effect, I used a matching Copic marker to color in the border. This helps frame the card, especially since it is a very minimalistic design. For a sentiment, I used the Be Strong stamp set and heat embossed it with silver embossing powder. And for a bit of shine, I added splatters with some Distress Spray Stain in Brushed Pewter. The splatters create a bit of interest that gives the cards a more “artistic” flair. 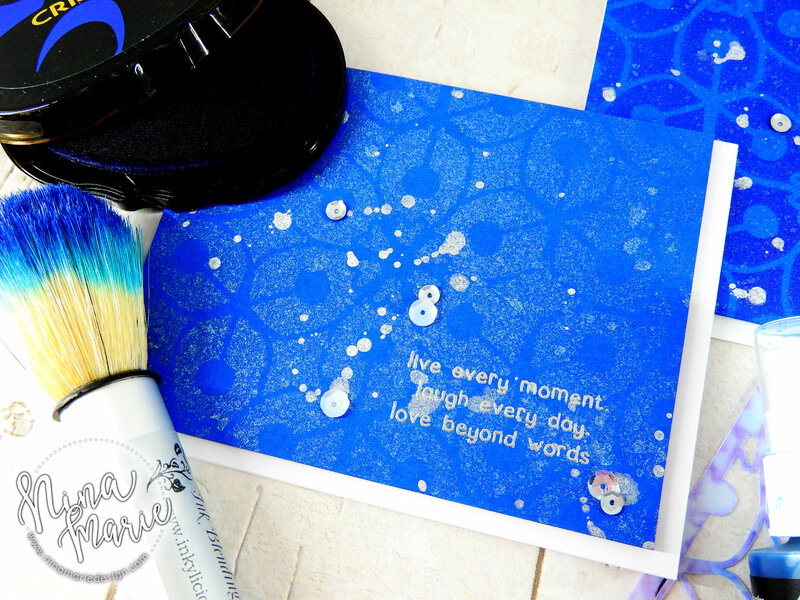 This next card again features the traditional stenciling technique but with a bit of a twist. Instead of using a single color of ink to stencil the pretty silhouettes of the Floral Drape stencil, I used two. With those two colors I created an ombré effect, which adds a lot of interest. The Ink Duster brushes make it really easy to blend the colors together! I finished this card off similar as to the purple one, except using gold accents in place of silver. For my last card, I create a background to go behind a focal point. With very subtle ink blending, I made a light colored pattern using the Sketched Lines stencil and a couple of Altenew ink colors. Because the style of the stencil felt very “southwestern” to me, I decided to pair the background with Altenew’s Be Strong stamp set. 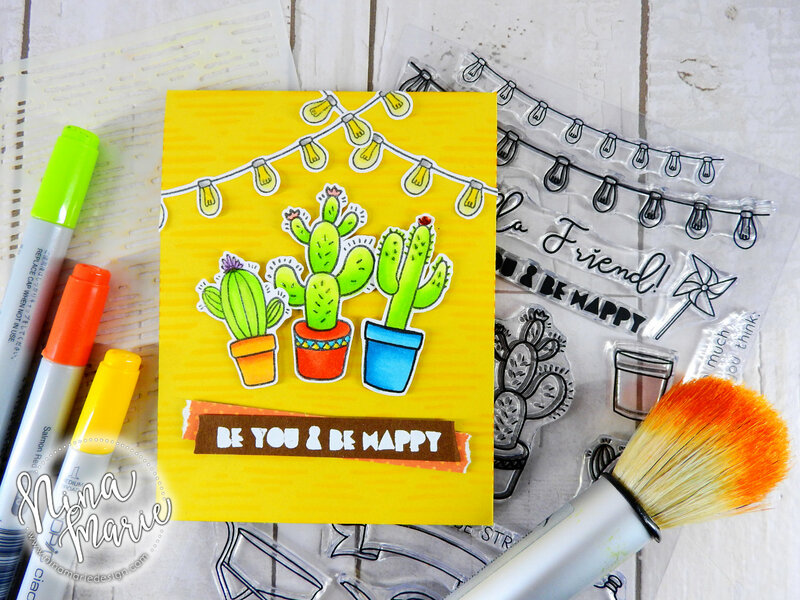 The cacti and light string were colored with Copic markers and I added a heat embossed sentiment strip across the bottom. Those of you that visit my blog frequently know I enjoy watercoloring quite a bit. 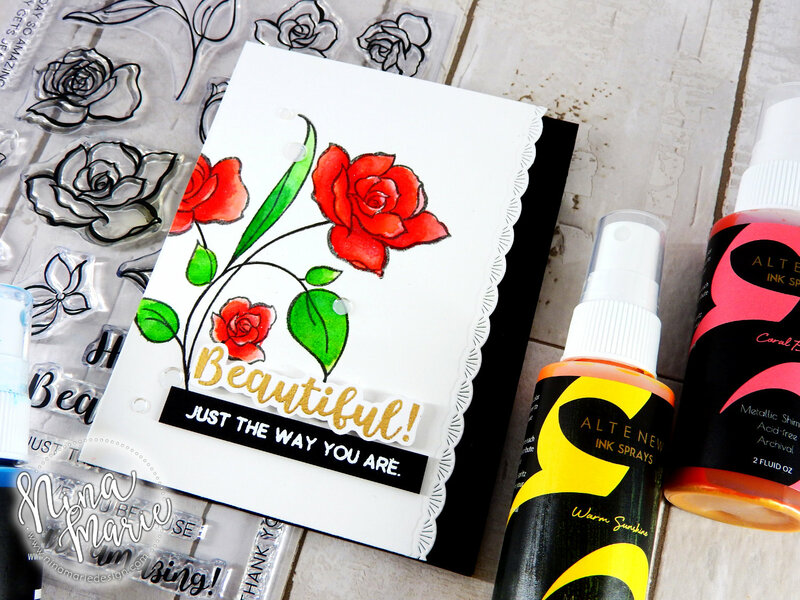 Did you know that you can watercolor with the Altenew Spray Inks? You can put a small puddle of spray onto a slick surface and then paint away! Remember that a little bit goes a long way. For a palette, I love using this one from Art Impressions. 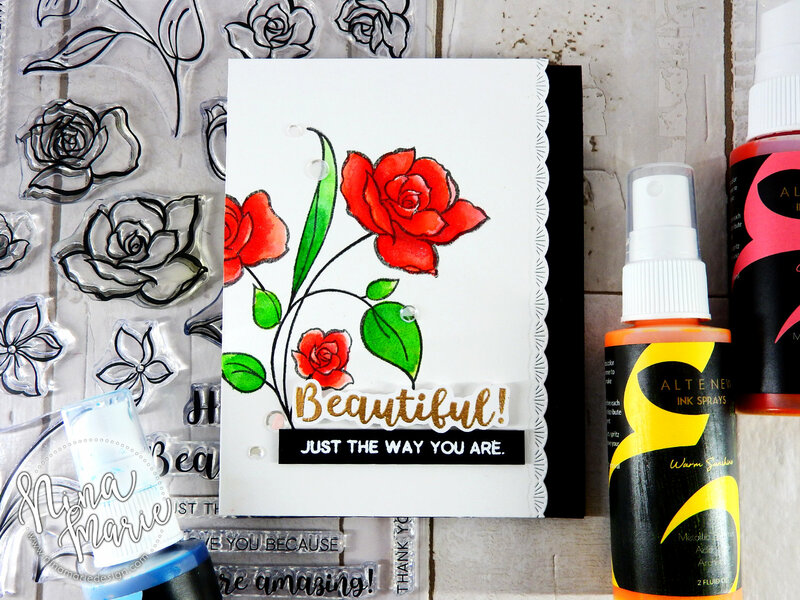 The images I watercolored with the sprays are from the Amazing You stamp set; the sentiments are from the same set as well. I popped the sentiments up off of the card and added a few Pretty Pink Posh Sparkling Clear Confetti sequins around the card. The scallop edge is created using a Tailored Stitches die from Memory Box. Be sure to check out the video below to see all of the techniques in action! 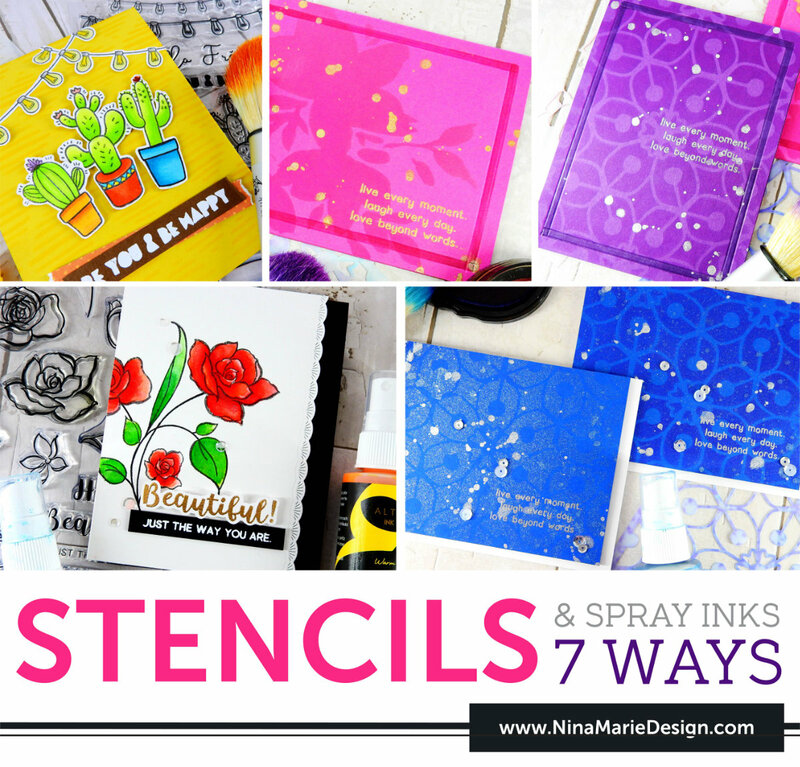 There are so many things you can do with both stencils and spray inks… what I covered today is just a tip of the iceberg, but I hope it was helpful and fun for you to see! To keep hopping along in the Altenew March Release hop, your next stop is Eunyoung Lee. All the links for the rest of the hop participants are listed further down in the post. Thanks for visiting me today! Thanks for so much for sharing…you opened my eyes to new ways to use sprays and stencils. I really liked the watercoloring. I would never have thought to watercolor with sprays. Love you cards, the stencils and the new sprays! BOLD, BEAUTIFUL, FUN & FABULOUS! Thanks for showing how you used the new sprays. 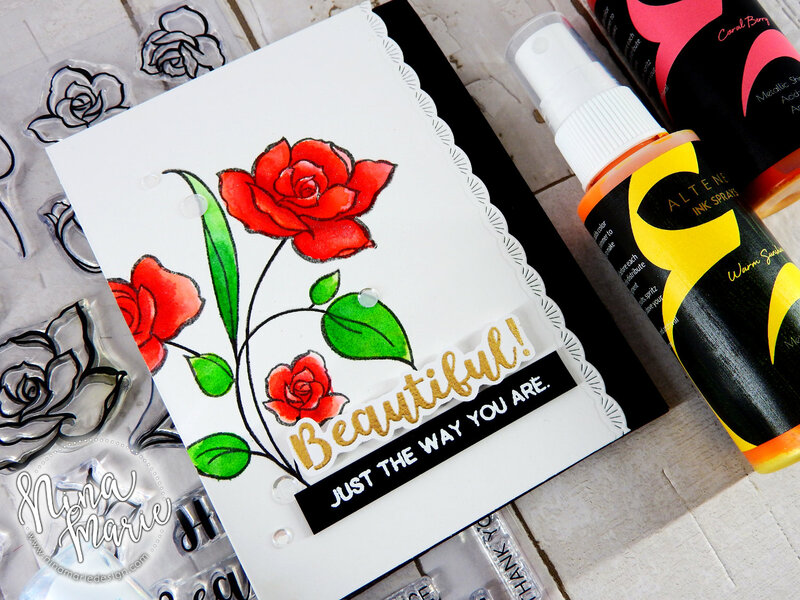 I loved your cards–and the new Altenew stencils. Love the stencils. And the sprays. As always Nina Marie, you amaze me with your talent and great designs, love the many ways you used the new stencils, thanks for the inspiration! Great techniques! Love the bold colors! What a great set of cards. These sprays seem to be wonderful.